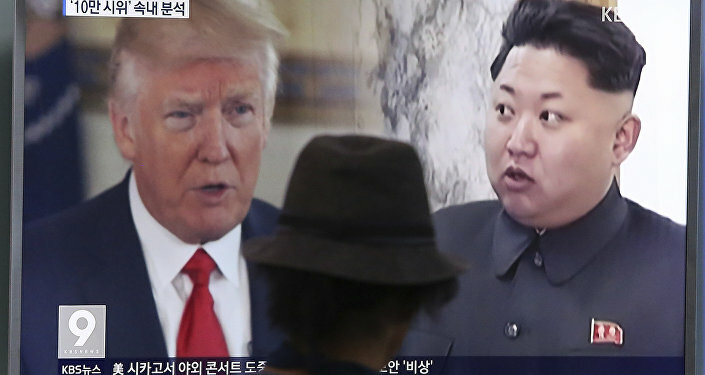 US and South Korean intelligence have seen indications that North Korea may be preparing for new missile launches, South Korea’s daily The Dong-A Ilbo reported citing government sources. The US military believes that the upcoming US-South Korean naval drills may push North Korea toward new actions. A US satellite took pictures of ballistic missiles mounted on launchers being transported out of a hangar to somewhere near Pyongyang and North Pyongan Province, according to the report. A source said US military officials believe this could indicate preparation for a launch of a missile comparable to the Hwasong-14 intercontinental ballistic missile (ICBM) or Hwasong-12 intermediate-range ballistic missile (IRBM). Another scenario could be a launch of the new Hwasong-13 solid engine missile that has a longer range than the Hwasong-14. "The North may carry out a simultaneous launch of an ICBM and IRBM within a few days, in protest against the US show of military might," another source told the newspaper. Earlier, the USS Michigan, a nuclear-powered US submarine equipped with 154 Tomahawk missiles, arrived in the South Korean port of Busan. Following the submarine, an aircraft carrier group led by the USS Ronald Reagan will be deployed to the region next week for joint drills with the South Korean military. Meanwhile, Australia has pledged to continue to support its allies in deterring North Korea’s nuclear and missile ambitions. Earlier, North Korea threatened Australia with "disaster" if it continues to support US-led military, political and economic pressure on Pyongyang. "We will not be cowed by the North Koreans. We will continue to do all we can to protect and help and support our allies," Australian minister for veterans’ affairs Dan Tehan told Sky News Sunday. He added that the international community is ready to cooperate with the North if Pyongyang reigns in its nuclear program. In the most recent case on September 15, North Korea launched a ballistic missile, which flew over northern Japan before splashing into the Pacific. The launch came just days after the UN Security Council approved sanctions against Pyongyang over its missile and nuclear program. On September 3, the North conducted its most powerful ever nuclear test, which many believe to be an H-bomb.